Part 1a and Part 1b of this tutorial covered how to set up the cloud-hosted MongoDB database, Node server, and front-end for our real-world Angular application. The second installment in the series covers authentication, authorization, feature planning, and data modeling. Factory to authorize HTTP requests with an access token. Let's create a file to store information about our app's environment. We're currently developing on localhost:4200, but the app will be deployed on the Node server eventually, and in production, it will run on a reverse proxy. We'll need to make sure our development environment doesn't break our production environment and vice versa. This code detects the host environment and sets the app's base URI and base API URI. We'll import this ENV configuration wherever we need to detect and use these URIs. We'll store our Auth0 authentication configuration in an auth.config.ts file. Create the following blank file: src/app/auth/auth.config.ts. // and update login status subject. // in localStorage, log out. This service uses the config variables from auth.config.ts to instantiate an auth0.jsWebAuth instance. An RxJS BehaviorSubject is used to provide a stream of authentication status events that we can subscribe to anywhere in the app. The constructor checks the current authentication status upon app initialization. If the user is still logged in from a previous session and their token has not expired, the local properties are set using data from local storage and the loggedIn property and loggedIn$ subject are updated. If the token is expired but the user has not logged themselves out, the logout() method is executed to clear any expired session data. The login() method authorizes the authentication request with Auth0 using the auth config variables. 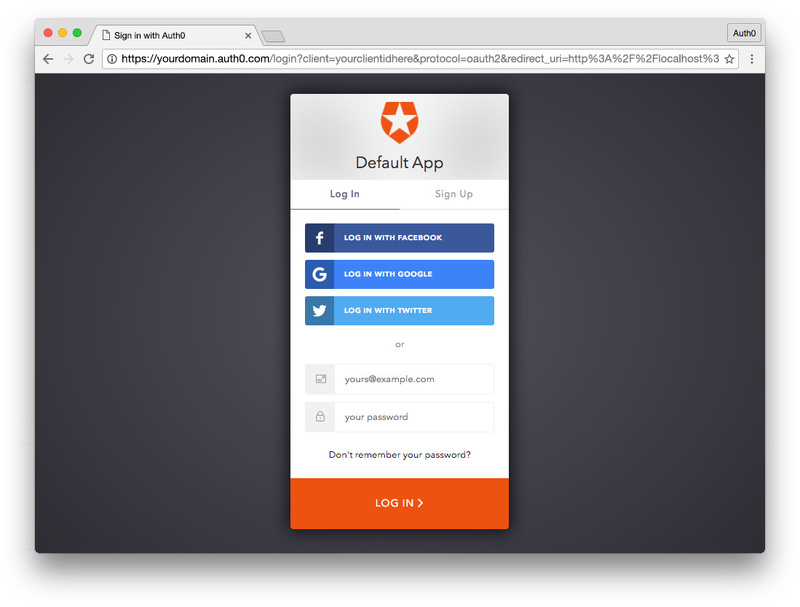 An Auth0 hosted Lock instance will be shown to the user and they can then log in. We'll receive an id_token, an access_token, and a time until token expiration (expiresIn) from Auth0 when returning to our app. The handleAuth()method uses Auth0's parseHash() method callback to get the user's profile (_getProfile()) and set the session (_setSession()) by saving the tokens, expiration, and profile to local storage and calling setLoggedIn() so that any components in the app are informed that the user is now authenticated. Finally, we'll define a logout() method that clears data from local storage and updates setLoggedIn(). We also have a tokenValid() accessor to check whether the current DateTime is less than the token expiration DateTime. Next, we'll create a Callback component. This is where the app is redirected after authentication. This component simply shows a loading message until hash parsing is completed and the Angular app redirects back to the homepage. Note: Recall that we already added http://localhost:4200/callback and http://localhost:8083/callback to our Auth0 Client Allowed Callback URLs setting. Now we have the logic necessary to authenticate users, but we still need a way for them to log in and out in the UI. Let's add this in the Header component. We'll import our AuthService and declare it in the constructor function. Note: We're using public because the authentication service's methods will be used in the template, not just in the class. We've added a <div class="header-page-authStatus> element. We'll use the ngIf directive with the loggedIn property from our authentication service to determine if the user is logged in to show or hide the appropriate markup. If the user is not logged in, we'll show a "Log In" link. If they're already authenticated, we'll show their name and a link to log out. Note: Notice the auth.userProfile?.name binding. The ?. is the safe navigation operator. This operator protects against null and undefined values in property paths. If the object is not yet defined, the safe navigation operator prevents an error from occurring and waits to render until the data is available. We can now log into our app! Try it out in the browser. Once logged in, you should see your name and a link to log out in the upper right corner of the header. You should also be able to close the browser and reopen it to find your session has persisted (unless enough time has passed for the token to expire). Now we have authentication working in the front-end, but we also need to use the access_token to make authenticated API requests. In order to facilitate this, we'll create an AuthHttp factory using angular2-jwt. This factory will allow us to use an authHttp method in the place of httpwhen we want to send an authenticated request. The angular2-jwt package will look for an access_token in local storage and use this as a Bearer Authorization header. Add Http and RequestOptions to the imports from @angular/http. Then import AuthHttp from angular2-jwt and the authHttpFactory we just created. Then we'll provide AuthHttp with its factory and dependencies. Now we can use authHttp as a method to make secure requests. Tune in for Part 2b where we'll discuss Admin Authorization, Data Modeling, and Planning App Features.